I was first put into the idea of diving the Mesoamerican American reef by Mike Alt back when we lived on Pemba Island, in Tanzania. Mike had had enough of Zanzibar and wanted to do something different. So he called up, jumped on a propeller plane and then walked into our dive lodge on Pemba Island. He took one look at the place and instantly booked a week’s diving. Mike was taken by something that we did that kept him coming back year after year. We became friends and he in turn invited us to come to Xcalak. Getting to his tiny part of the Mesoamerican reef involved a 5 hour drive from Cancun airport, the final part being down a dusty track. 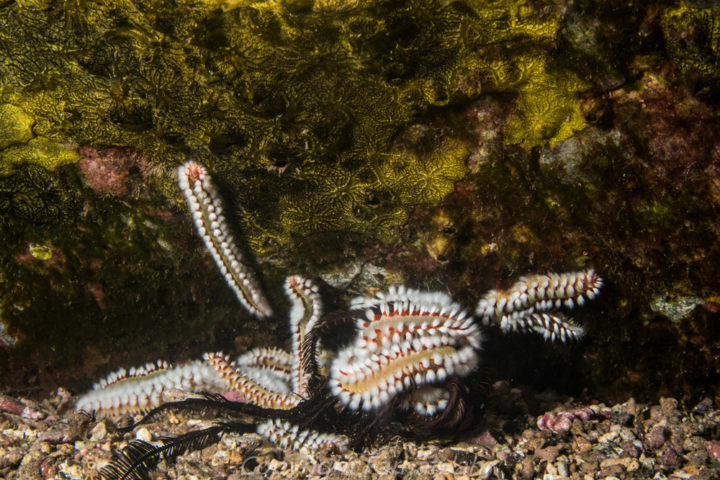 We dived the southern reefs of Mexico with Javier Salas of XTC dive centre. Back at his house, with a stunning bottle of Argentinean red open, I asked mike what made him so interested in the reef that ran from Cozumel in the north, down the Yucatan peninsula, through Belize and down to Honduras. I had always known it as the Belize Barrier reef, but I was wrong. Mike explained that in the 1980’s he had read a National Geographic magazine about an expedition by NOAA down the reef to the Chinchorro Banks. 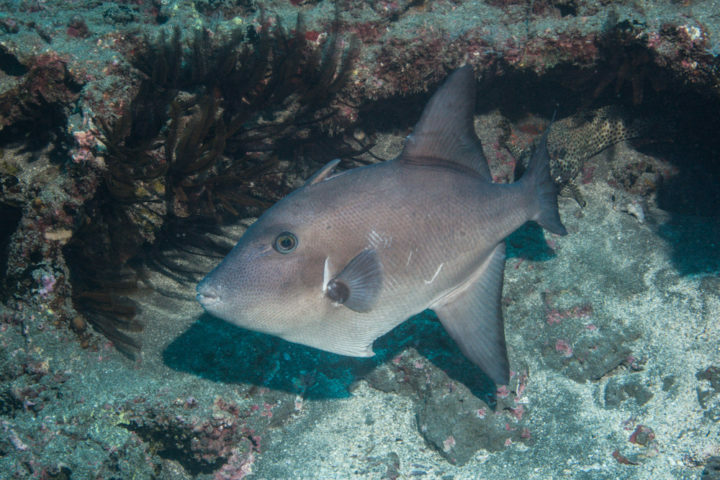 The Mesoamerican reef comes close to the shore in some locations and has some outer banks. The Chinchorro banks were the outer reefs opposite the village of Xcalak, which ironically had the reef within swimming distance of the shore. Mike was a professional doctor but he might as well have been a professional diver. He stopped logging his dives at 1000, when he was in his thirties. His fascination with the reef was compelling, and over many chats in the intense heat of the Mexican night, we discussed Mexico as it was in the 1970’s the ‘80s and finally into the 1990’s. 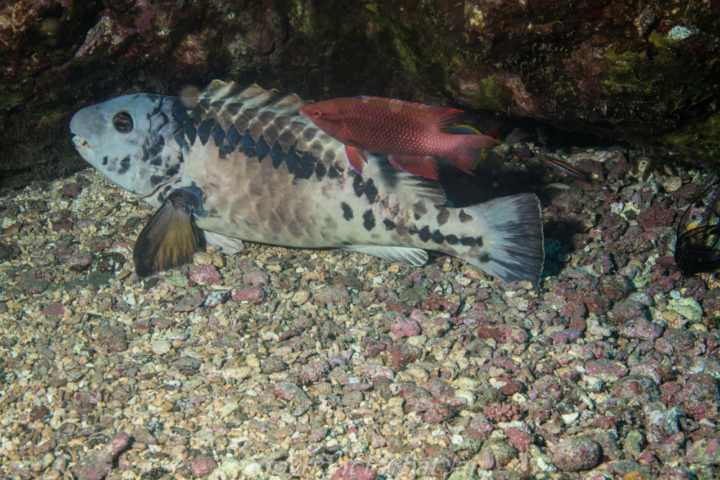 Mexico and her underwater world had something very special to offer. Year after year we dived the Mesoamerican reef with Mike and Javier, learning each individual cave and dive site better and better. But life caught up with us all. We sold our dive shop in Tanzania to concentrate on being the best small dive and safari tour operator in Britain. Mike grew tired of the heat and moved to Chiapas state in central Mexico. Javier was kind enough to invite us down to stay with him and dive, but it did not seem the same without Mike. He in turn never returned to Tanzania without us. It was a chance meeting with Paul Flower of Dressel divers who put the Mesoamerican reef back on the agenda. He suggested we dive with him. Last year on our way to San Cristobal De La Casas, we stopped off in heavily commercialised Playa Del Carmen. Paul arranged for us to dive the reef in front of the hotel. 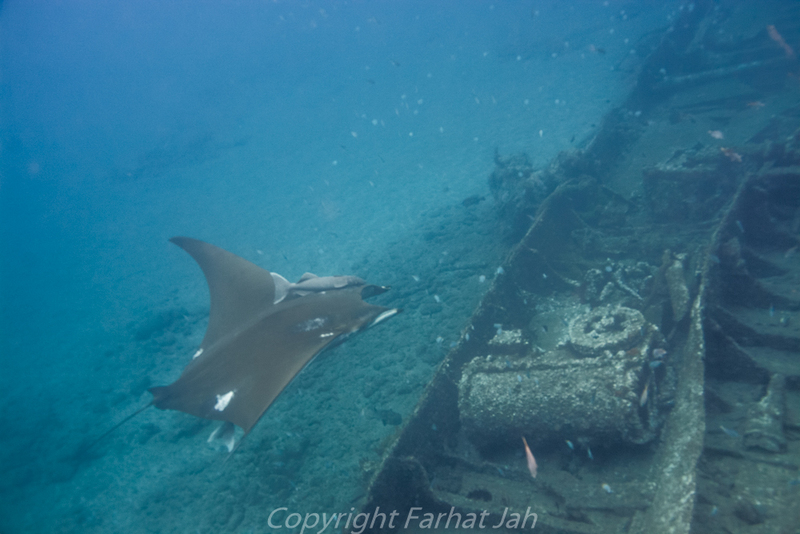 I did not have high hopes, but was very surprised to find the diving as diverse and pleasant as anywhere on the reef. What it lacked was the underwater landscape of Xcalak. Buoyed with such good diving, Paul suggested that we visit his centre in Cozumel. After some thought we agreed and asked around if anyone would be keen on joining us. Eleven months and a small group later, we found ourselves looking out of the window of an Alaska Airlines Boeing 737-800 over impenetrable bush while descending into Cancun Airport. Cancun has a bad name, perhaps given to it by the visiting all inclusive American sun tourists. But they do it a disservice. Cancun’s centre has a certain concrete charm to it, with friendly people and excellent restaurants. But this did not really feel like Mexico. We stayed in the excellent and cheap hotel Amontilado, which had some impeccably behaved Russian group guests and a few other nationalities. It was a far cry from the all inclusive beach monstrosities. Every bad side brings a good, and the infrastructure of the northern Yucatan is excellent. The next morning, we bussed down to Playa del Carmen with Adam and Maya (two friends) . There we painlessly boarded a rather modern looking catamaran and thundered off across the Caribbean sea to the island on the horizon. We spent very little time in Cozumel town, but the town itself looked majestic. Low white buildings, small shop houses and polite people abounded. We climbed into a taxi and puttered off to our hotel in the south. Dressel Divers use the iberostar chain, and while all inclusive is not my thing, the iberostar was full of divers. It also had excellent food buffets with tons of vegetables and healthy options. The coffee was appalling and there was no hot water to make tea, but apart from that it was great. Maddy was rather taken aback by my direct nature, but she got to grips with our madness and assigned us Omar, a Christian Mexican of Lebanese descent. Omar was quite simply brilliant. He knew what to say, how much to say, and how to treat us. We in turn behaved impeccably and gave him no trouble. The only bad boy was me, when I lagged slightly behind and below the group, but Omar was patient and I finned like hell to catch up. (having a camera is no fun sometimes). Omar had a girlfriend called Anna, who was a very different dive guide. She was blessed with mixed groups of Americans and handled them so well. She was charming and delightful, but I was rather glad that I was allowed to slack off by Omar, I was sure she’d have made me and Cisca keep up! In addition to all this, Paul was happy for me to run a NAUI nitrox course for three of the team and a NAUI advanced course for two of our former peace corps volunteers. I have always loved training, especially advanced training, and it was a privilege to be able to teach Nikki, Kyle and Adam. What was interesting was the difference in buoyancy control between a NAUI trained diver (by my former staff) and a PADI open water diver. I will not lie, the NAUI diver was superb, and the PADI diver, with very similar experience (he was her husband) was not quite as perfect. Lets leave it at that! The diving in Cozumel was like no other. It did not have many steep walls in the conventional sense of the word, but it had a series of pinnacles with massive fans, and swim throughs. 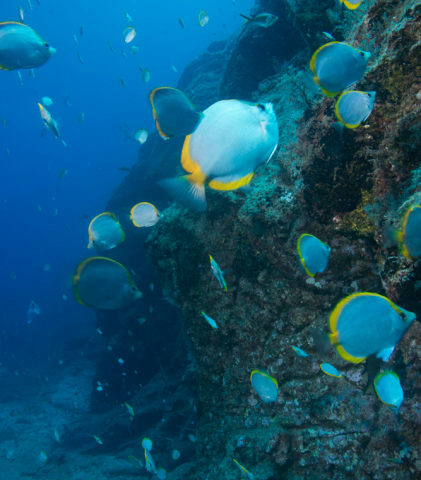 The diving was very similar to Mtwara in southern Tanzania, with the tops of the reef being at 50-70ft and the pinnacles going down to 40 metres before a very steep sloping bottom descended into the blue. We were all diving on 30-33% nitrox, and so even with my computer set to a partial pressure of 1.4 the thing started bleeping at 118ft. I am far more bothered by nitrogen absorption than by oxygen toxicity, and many of my dives were deep, I kept glancing at my analogue depth gauge and momentum torpedo watch. The bezel was especially useful for the half stops, and long safety stops that I did. Without going into detail, I have studied decompression theory and various tables. I am a firm believer that the half stop and two safety stops at 27ft and 18ft are the best insurance policy, But that is a subject matter for another blog. The words above barely touch on the stunning beauty of Cozumel. 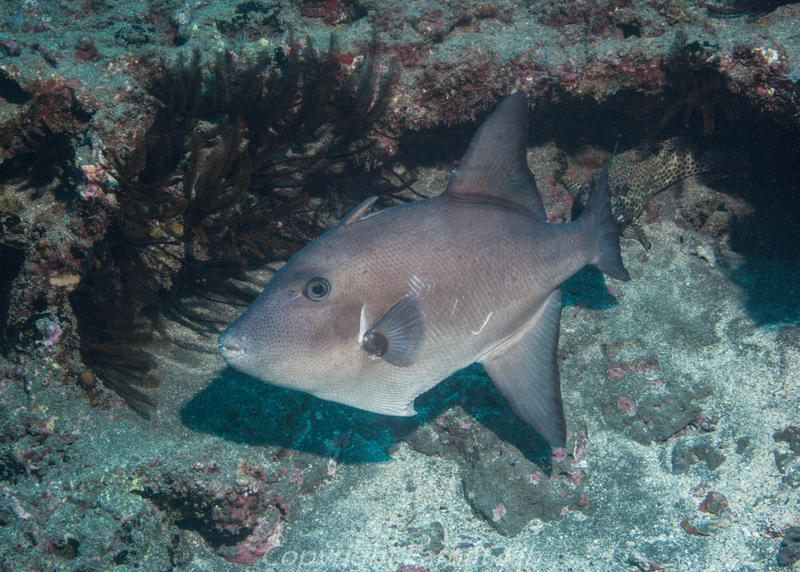 There were some underwater grass fields, but these had a plethora of nurse sharks, giant fans and coral heads and below 90ft, some very steep walls. The diving was unbelievably good and great value. Every evening at sunset, most of the American guests would go inside to shower and prepare for dinner. We the ex-Africa mob would shower the salt off well before and make our way to the wooden jetty. There we would gather on the end of the jetty watching the sun disappear and then shed rays on the massive cumuli nimbus clouds. All too soon the week was over. It was time to check out of the hotel and take the ferry back to the mainland, Nikki and Kyle flew back to Boise Idaho, while the rest of us went pyramid bashing. Three days after that we had to split up again. Francisca and I flew to Chiapas, Uwe and Laura flew to Portugal Singapore respectively while Adam and Maya took their time to take in more pyramids. Days later I found myself sitting on a pavement at 7000ft, watching the world go by, snapping the occasional black and white photo with my Nikon FM2. 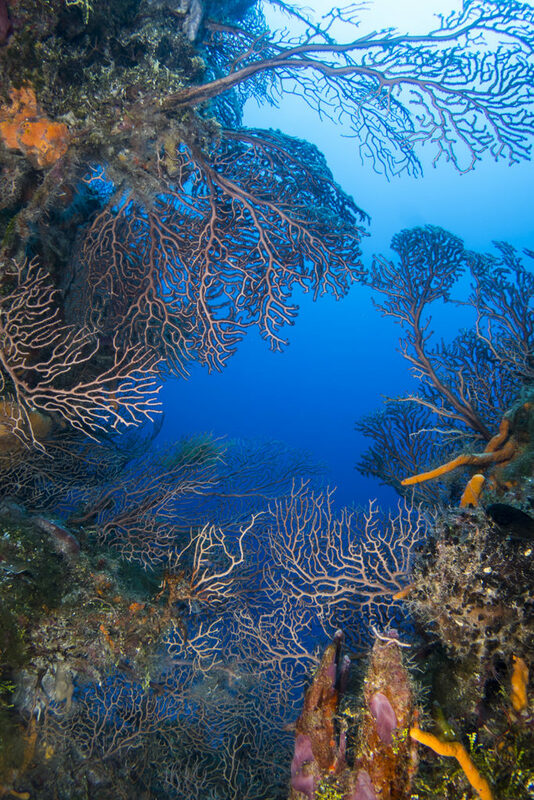 The world of Cozumel and the Mesoamerican reef seemed so far away. But perhaps a return might be in order? Much has been made of the new airport on St Helena Island. And much has been made of the dramatic landings on St Helena. Our reality was simple a 3hr 15 minute flight from our last refueling stop over the azure Atlantic Ocean. 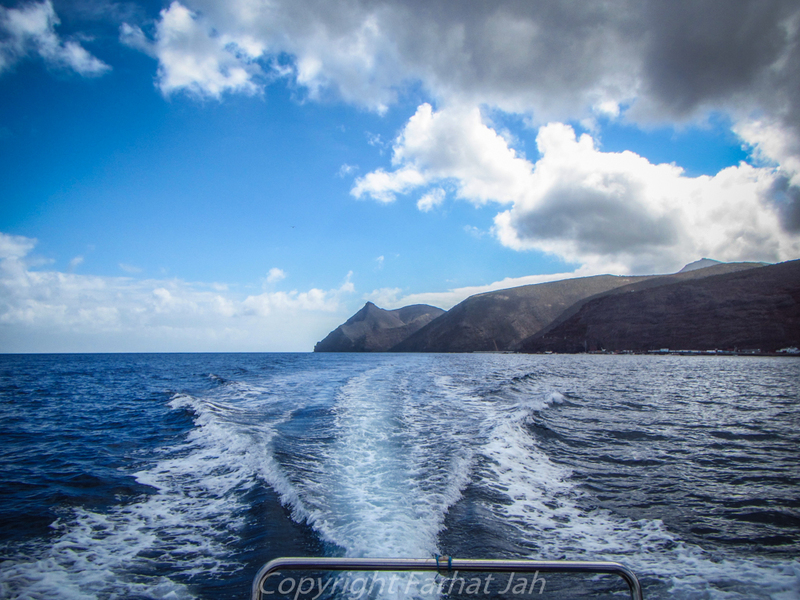 As we approached St Helena, I peered out of the window at the clouds and the shape that was the Island. We made one pas by the island before beginning our approach. We curled past an impressive brown knob of rock and suddenly banked to the left and descended slightly. With a healthy bounce, we made contact with the runway. The pilot steadied us, and then all three wheels were on the tarmac and with reverse thrust and a bit of breaking the Embraer E90 rolled to a stop. St Helena Air Terminal looked ultra-modern with its shiny glass exterior and clean parking mat. State of the art crash fire tenders, ambulances, refueling trucks, various vehicles along with an out of place Dennis town fire engine were parked near it. In the afternoon sun it all looked quite delightful and breezy, like a tiny regional British airport in glorious summer sun. For this was all undeniably British. Sadly, the vestiges of Britain were also in attendance, with needlessly officious immigration and quarantine officers. This was not the United Kingdom of 2018, but of my childhood in the 1970’s. Rather than be bothered by the foolishness of the situation, we made jokes about it until we finally exited the building. The airport has been misnamed Jamestown Airport, but in fact, it should really be called “Spider Hill Aerodrome”, for it sits next to the world famous Spider Hill. Indeed its runway sits in the direction it is, wind shear and all, to save the protected funnel web spiders. In the carpark, our friend and contact Anthony Thomas of Sub-Tropic adventures met us and loaded our bags onto two vehicles. We set off along a winding road towards Half Tree Hollow and our accommodation. The jeep must have passed through four different ecosystems, barren desert to lush green forests and small patches of farmland. After dumping our frogman kit, Anthony took us on a quick cooks tour. The Island consisted of a large volcanic rock with lush green valleys, peaks and mountains starting at 2000ft. With the cooling wind blowing at altitude, you could almost think you were in the valleys of Wales. Then we descended to Ladder Hill Fort. Pronounced “ladi hiw for” by the Saints. This was an impressive fortification that overlooked Jamestown and its sheltered harbour. Once a simple East India Company fortification, Ladder Hill Fort had evolved over the centuries with its last additions of Naval Guns being added in the second world war. Now it was home to the “interim fire station”, a tin-roofed shed that housed a couple of British Dennis fire appliances and a Carmichael conversion- firefighting land rover. When I asked, I was told that the interim fire station was in fact the main fire station and had been “interim” for 20 years. The fort was open to all, and afforded views of the yachts at anchor and the tenders and barges that service the Royal Mail Ship St Helena. The RMS as she was known by the saints was due into harbour for its last sailing in a few days. Below us was a series of 700 large steps that’s descended 700ft down into Jamestown. These steps were called Jacobs ladder. Once a supply railway to the fort, it had now been transformed into a steep shortcut from town to Half Tree Hollow. We declined to descend the 700 foot high steps and drove sedately down into St Helena’s administrative capital, Jamestown. This turned out to be a quaint English fishing village, with no recognisable shops. It has the same air as parts of Malta and Gibraltar, but with quintessentially British people. The saints spoke with a patois that sounds to have its roots is somewhere between Cornwall and Australia. The only downside was that the only restaurant that was open every night was that of the Mantis. Other restaurants or cafes would open for a few hours on certain evenings to cater for the saints and expats wishes. After a quick familiarisation with the sea, post office, tourist office and the rendezvous point for diving we drove back up the hill and went for dinner. St Helena was not the most conventional of islands. Its towering rock cliffs had occasional fissures that dropped down to the sea in steep-sided valleys. At the end of these valleys there was sometimes access to the sea. This could be in the form of a rocky cluster or a stone beach. At the mouth of every Jamestown was a case in point. The end of the valley was capped with a fortified wall which sported a large gate. Beyond the wall was a, now dry, moat, the seawall, and a shingle beach. There was no jetty as the island had no deep-water wharf. All ships had to anchor in the bay and have the containers and passengers offloaded by lighter or barge. Every single person onto and off St Helena had to arrive or leave from a set of steps 20 foot wide. Anthony Thomas had just rented new premises for the Sub Tropic Adventures Scuba Diving Centre, but had not as yet, made the move with all his kit. As such, we assembled by the famous steps and waited. A white Ford transit pick up appeared and Anthony and his no 2, Paul Cherret started to unload everything. We pitched in and helped while Anthony took a skiff out to collect his rib. Loading up took seconds and we were on our way. Anthony was apologetic: “This is not normal, soon we’ll have the dive centre down here and we’ll pre-load the boat and you will simply step aboard”. Anthony was definitely on the ball, but it made the expedition more real to unload our dive kit, cylinders and weights, before assembling our scuba kit on the wharf. Just as we were ready, Anthony appeared with a solid South African manufactured RIB equipped with radio, first aid kit, oxygen and twin 115 Suzuki four stroke outboard engines. Getting into any vessel from St Helena involves a step of the famous steps. Ropes hang down from a metal pole to allow people to pull themselves up at low tide. It seemed incongruous to depart for a dive trip in exactly the same was as governors, saints, traders had for over a century. Anthony turned east and we zoomed out on the flat calm water. It was a grey day for summer, and we looked back at the island, which looked like a forbidding brown rock made up of towering cliffs and nothing else. Fifteen minutes later we arrived at Long Ledge. Paul threw the Anchor in, and we checked our air and kit. After a safety check, we rolled backwards into the water and descended to 6metres (18 feet) and waited for Anthony. At 22’c the water was unseasonably cold, and I regretted not bringing my hood. I squirmed and wriggled until all the water in my 5 mm mares suit was warm. I had chosen to buy a standard 5mm suit, rather than some fancy so-called semi-dry effort, and with careful use, the mares was quite fine. The others soon appeared and Anthony led us into a series of swim-throughs or large caves. Each of these caves was brightly lit by shafts of light that pierced into the blue water. The water was extremely clear. The bottom seemed to be a mixture of sand and rock, and yet the rocks were colourful under a torch and between each one there was life of some sort. 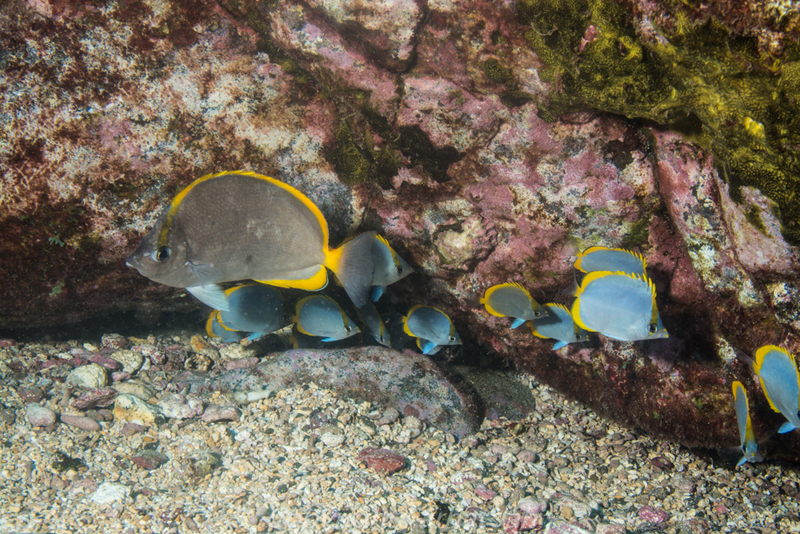 Nudibranches, flatworms and small fish were everywhere. Inside the caves, there were schools of sergeant majors and Squirrelfish. Anthony led us along a series of ledges until we ended up swimming along a finger that pointed out to sea. The bottom dropped away below us, and as we got to the end of the finger the marine life started to build up. The fish were clearly attracted to the point. This was long ledge and we were at the end of it. 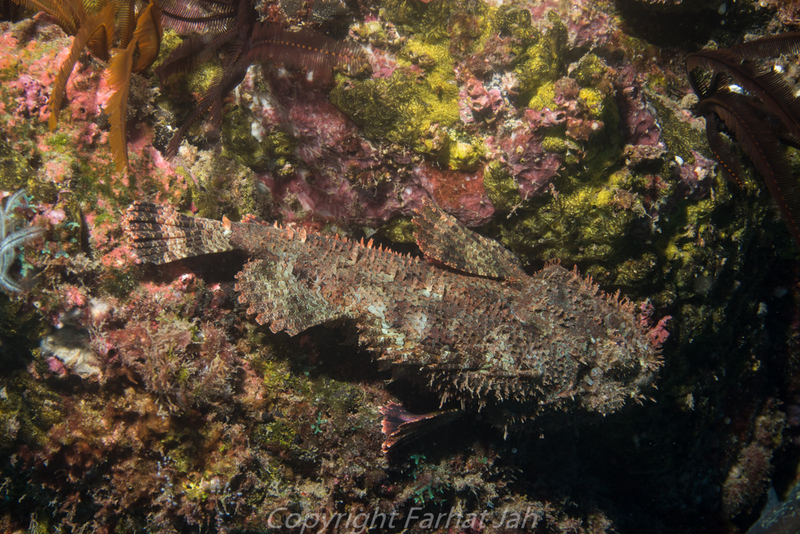 I popped down to 26 metres to have a look at the base of the ledge and found some moray eels and pipefish wandering around, but by this time I had been diving for 45 minutes and my air was getting low. I slowly made my way back up and Cisca and I continued along the ledge at 10 metres, and then 6metres, slowly off gassing as we went. 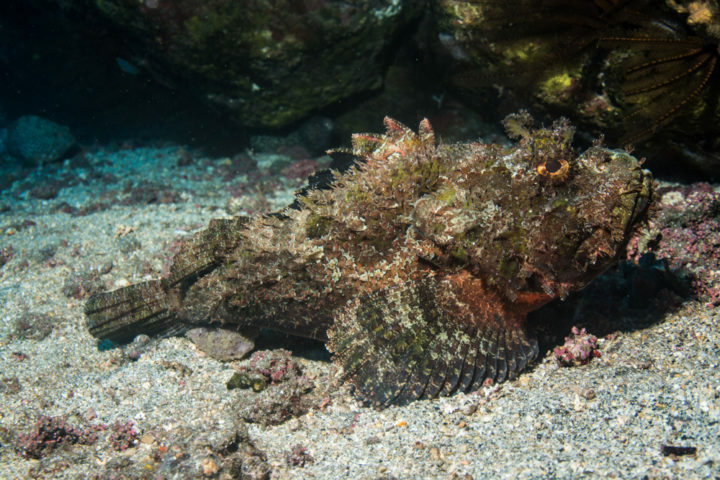 We spent five days diving in St Helena, snorkeled with whale sharks, and went for afternoon walks in the green valleys. It would be quite boring to list all of the dives, but if there was one dive that summed up the reason to jump on a plane to St Helena right now, it was Torm Ledge. 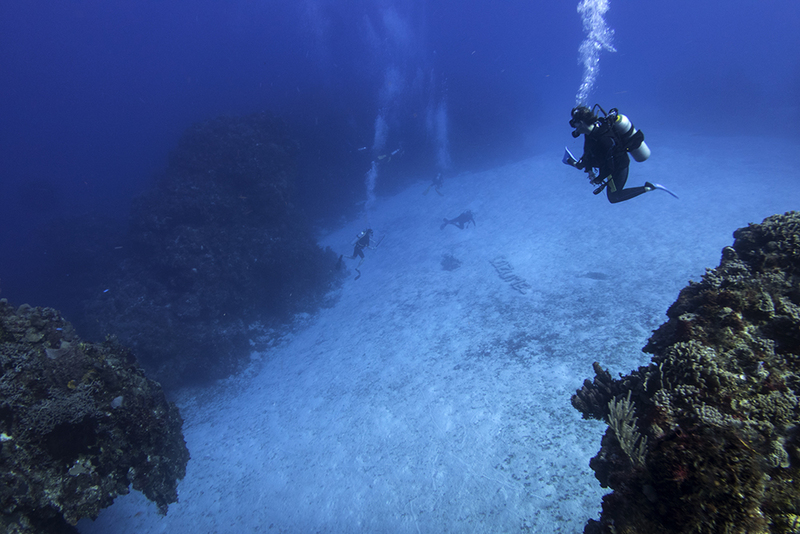 This diving in St Helena is based upon a ledge that is about 45metres deep and runs a mile out to sea. Only there does the drop off really begin and descend to 3000m. 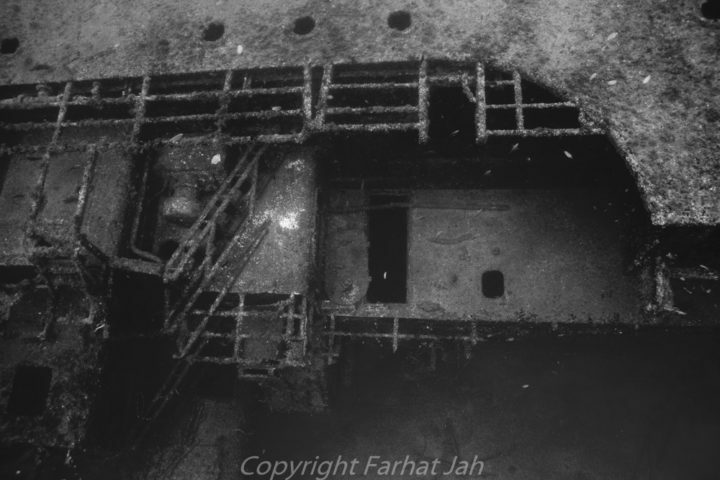 Torm ledge turned out to be an underwater pinnacle that rose up from the sea bed. We dropped in at 9 m and were immediately surrounded by amberjacks, giant trevally and rainbow runners. 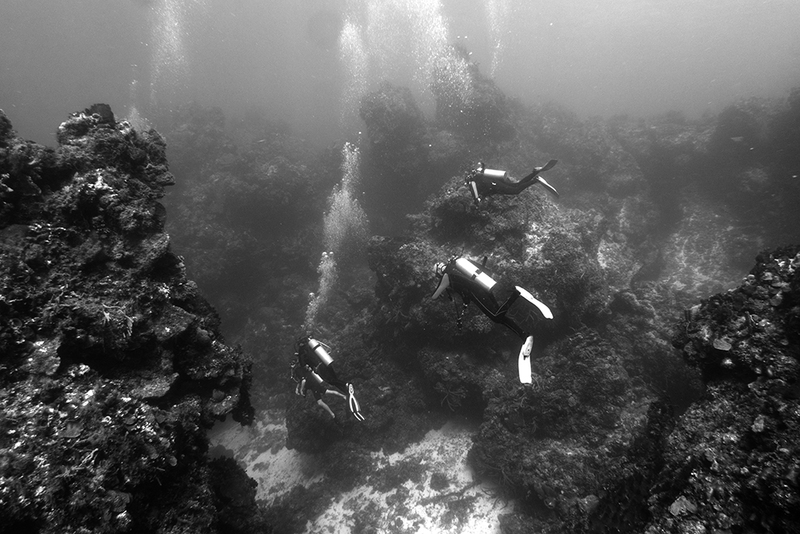 As this was our last day underwater, I dropped down to 36 metres and swirled lazily around my camera. They bumped into me, blew bubbles and hunted in front of me. 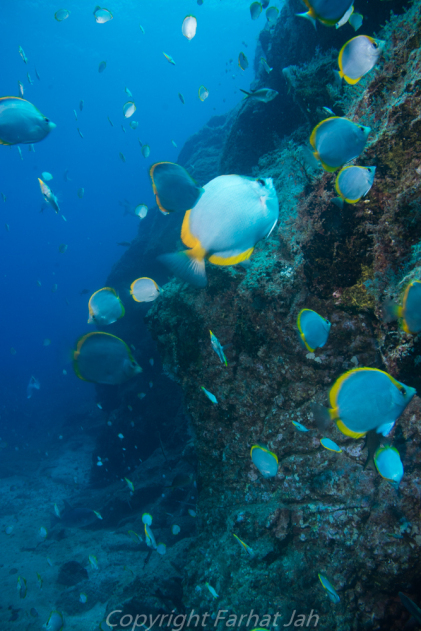 As I made my way back to 18 metres, a cloud of powder blue surgeonfish covered the top of the pinnacle and when they lurched into the blue, they blotted out the sun. Cisca and I sat in the cloud, finning gently in the current watching the pelagics play and hunt. Just when I thought it could not get any better, a dark shape loomed out of the blue and cruised slowly up to us. An enormous whale shark was right in front of us. It was so slow, I could even snap a photo of Cisca with the shark in the background. 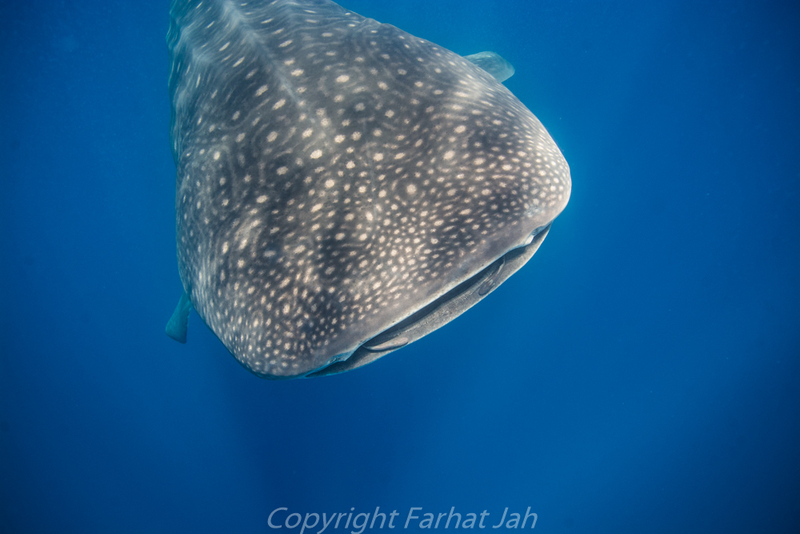 Thew whale shark cruised away around torm ledge and came back keeping us comoany unril the end of the dive. As we climbed back onto the rib, the whale shark, not satisfied with saying hello once, hung around us under the diver boat. We could literally see him from the pontoons. Someone slid into the water with a mask and the whale shark just sat there unperturbed. The African and Oriental Travel Company are the St Helena and Africa Specialists. 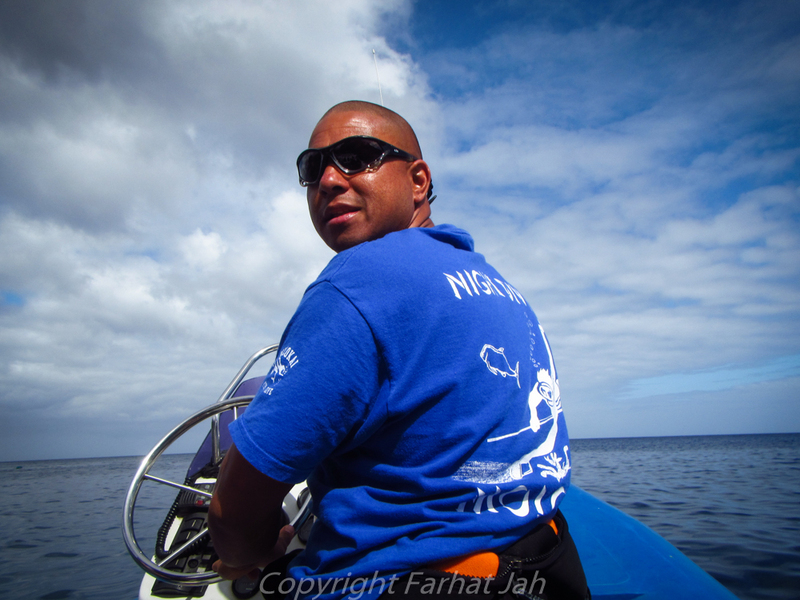 They organise dive holidays in St Helena from £800.00 per person. Flights are £780 from Johannesburg and £450 from The UK to Johannesburg. See the images below of why we love ST Helena. We had an amazing week on St Helena Island. 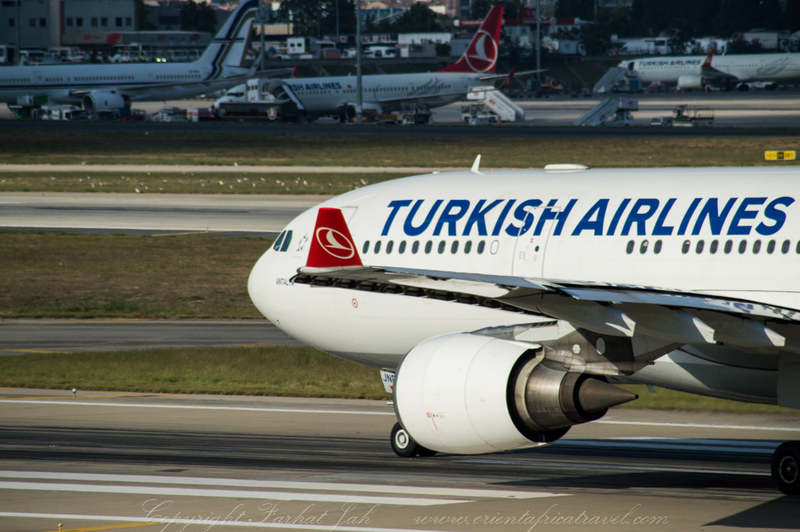 So what is Turkish Airlines really like? Everyone asks this question. While there is a lot of negative press about the airline, the simple answer is that across the board it works. My definition of working is: “It takes off, it does not crash, it lands- and generally all of this happens within an envelope of timeliness”. Turkish Airlines certainly does this. In addition to this, Turkish Airlines always feed you and the food and drinks are free. So far so good. So let’s go into some greater detail on what we think of the “the glorious Turks”, because it is not all perfect by any means.